As promised, the subject of this segment is the use of ritual animal dress in shaman practices/ animistic culture. In trying to find reference material (which elaborates upon the basic information I already know while adding credibility to my writing), I have made a frustrating observation: With so many New Age-y pages on shamanism/ animism, it’s hard to find good, legitimate sources on the topic. ::headdesk:: Also, my apologies in that I was a little later getting this posted than I had intended. Life happens. that animal costume served to connect to the spirit world, through the power of the animal. It is also generally the shaman who has the ability to perform such rituals (but this is not always the case, there are some non-shaman rituals during which participants dress up). rituals by trained dancers and storytellers. One of the important rituals was the potlatch. The potlatch was held for special occasions such as marriages, births, rites of passage, funerals, etc. These were essentially large gift giving ceremonies where there would be food, singing and dancing. 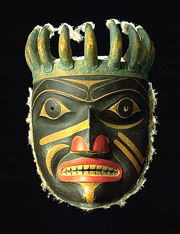 Often there would be dancers dressed in regalia, which included the intricately carved and painted masks, such as the wolf dancer in the photo to the left. In the 18th and 19th centuries, Canadian and American governments banned and outlawed the potlatch ceremonies. These bans were only repealed as recently as 1951 (11). For the indigenous peoples of Siberia, such as the Orochon and the Yukaghir, the reindeer was an important part of life. In fact, the name “Orochon” actually means “reindeer people”. The reindeer provided fur and meat, they pulled sleds and were even entrusted with carrying small children and babies. It was also the skin of the reindeer that the shaman wore, along with the antlers in some tribes. I’ve also read that the coat is made to represent a bird skin, so that the shaman can fly (10). Perhaps as a sign of the importance the role the shaman played in Yukaghir culture, upon death, his body was dismembered and a part given to each member of his clan (10). Today, while shamanism is still practiced in the region, it is no longer as wide spread. Reindeer are still a part of life, and some tribesmen have taken up breeding domesticated reindeer. Yukaghir Shaman Clothes. I have read that the skin is that of a reindeer, but I have also read that the skin is to be like that of a bird so the shaman can fly. My personal favorite occasion in which people don animal dress is the Eagle Dance. When I was a very young girl, my Grandfather used to take me to powwows. The part I always loved the most were the dances.. especially Eagle Dance, because of all the pretty feathers and how the dancer always looked so grand with his wings outstretched. Eagle Dance isn’t specific to any one tribe, as the eagle held deep importance for many Native Americans. This is by no means an exhaustive list, and while doing the reading for this entry, I came across other aspects of indigenous wardrobes that I would like to look into in depth sometime, such as Chilkat blankets. Not wanting to tangent from topic, I will have to remind myself to come back to it later. (Tangential researching, another factor in not having this posted on time, lol) In Part 2, I will be discussing Furries.